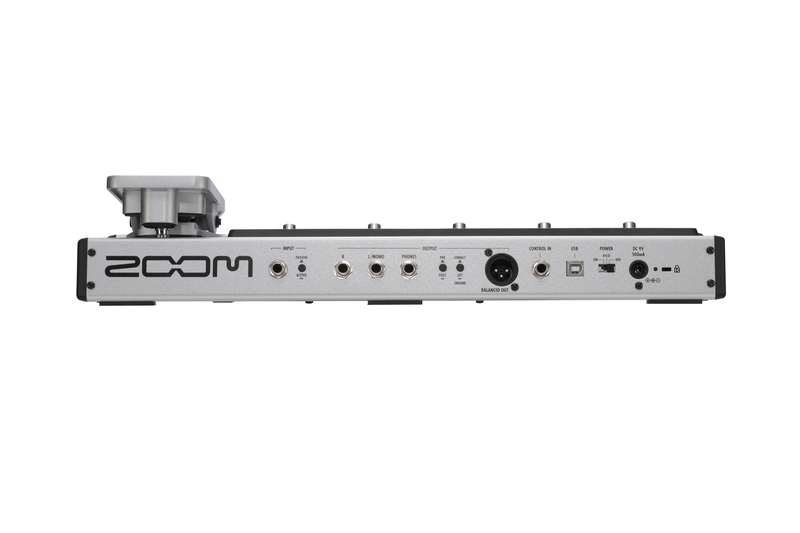 The Zoom G5 is a complete guitar pedalboard in one amazing device. Not only does it provide a whopping 123 effects and 22 amp and cabinet models, it allows you to chain up to 9 of them together for extraordinary multi-effect complexity. Four separate backlit displays—each with its own dedicated foot switch and control knobs—make it easy to edit effects and bring them in and out as needed. Advanced features include the revolutionary three-dimensional Z-Pedal and a 12AX7 tube booster, plus a balanced line-level output, onboard chromatic tuner, and an integrated rhythm machine and Looper. Wherever your guitar takes you, you can count on your G5 to deliver great sound and unparalleled flexibility. The G5 is loaded with 145 incredible-sounding DSP effects. These include 123 compressors, noise gates, filters, equalizers, and wah effects, as well as boosters, overdrives, fuzzes, phasers, and flangers, plus chorus, pitch shift, tremolo, vibrato—even ring modulation. There are simulations of both classic and contemporary pedals such as the MXR Dynacomp, Distortion+ and M-117R, Aphex Punch Factory, Moog MF-101, Ibanez TS808, Marshall Guv'nor, Fuzz Face, Big Muff, Pro Co Rat, ADA Flanger, Z.Vex Seek-Wah, and Boss OD-1, DS-1, Metal Zone, and CE-1. Original effects include Zoom's Noise Reduction (ZNR) algorithm and ExtremeDS, which offers the most powerful gain of any distortion effect in the world. Delays and natural-sounding reverbs include rooms, halls, arenas, plates, springs, and tape delay simulators, as well as dual effects such as compressor/overdrive, chorus/delay and delay/reverb. There are also an additional 20 expressive effects specially designed for use with the Z-Pedal. In addition, there are 22 amp and preamp models—vintage and modern, tube and solid-state—based on the best from manufacturers like Fender, Marshall, Matchless, ADA, Mega Boogie, Sound City, Hiwatt, Orange, Carr Mercury, Two Rock, Diezel, ENGL, Bogner, and Krank. Each comes with its own distinct virtual cabinet, and you can pair any amp model to any cabinet model to further alter the tonal quality. You can even match the output of a given amp/cabinet model to the actual setup you're playing through (options include Direct, Combo Front, Stack Front, Combo Power Amp, and Stack Power Amp). The intuitive design of the G5 allows easy navigation in both live and studio settings and makes creating, saving, and rearranging effects a breeze. 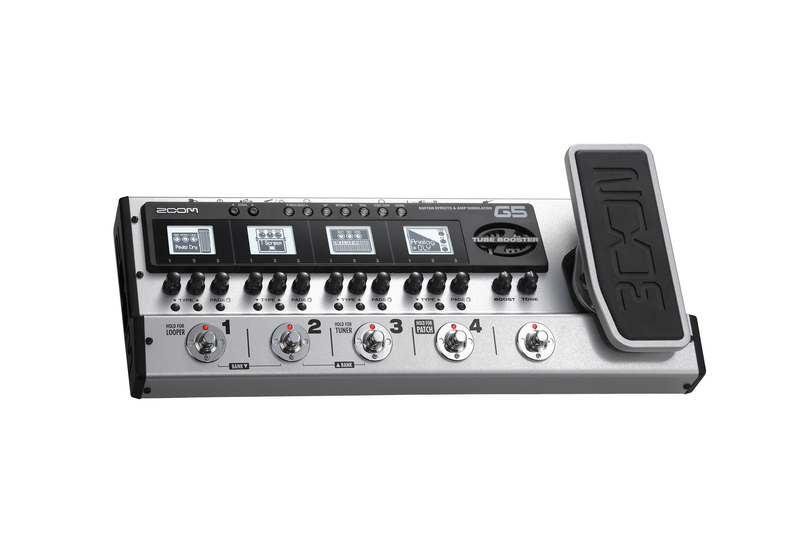 Four LCD screens, each with corresponding footswitches and parameter knobs, form a large graphical interface that allows you to view and edit multiple effects at a glance. Up to 9 effects can be used simultaneously, arranged in any order you like, and signal flow can be reversed at the touch of a button. 297 patch memories are provided for the storage of custom edited and chained multi-effects, all pre-loaded with useful factory settings. Changing patches is near-instantaneous and requires just a tap of a footswitch. A standard ¼" input jack and passive/active switch allow you to plug any electric guitar into the G5. Outputs are provided on dual mono ¼" and balanced XLR output jacks, enabling the unit to be connected to one or two amplifiers or to line-level devices (pre- or post-effect) such as external effects devices, recorders, and mixing boards. There's also a dedicated headphone output for private monitoring. The G5 offers a slew of advanced features, including a built-in Tube Booster—complete with a real 12AX7 vacuum tube—for warmth and intensity, plus up to 16dB of extra overdrive. There's also a built-in chromatic tuner that supports a variety of standard guitar tunings—even drop tunings. A Tap Tempo function allows you to to set delay times and modulation effect frequencies in real time to the rhythm of the song you're playing. There are 41 realistic-sounding rhythm patterns too—PCM samples of drums being played in a variety of different genres and time signatures. It's easy to create full orchestrations with your G5. An onboard Looper enables you to layer up to 60 seconds of performance (through the effect or effects of your choice) in high quality 16-bit 44.1kHz audio. The Looper can also be used in conjunction with rhythm accompaniments, allowing you to play along with the pattern of your choice. The G5's Z-Pedal provides a level of expression unsurpassed by any other guitar pedal. It senses not only vertical, but also horizontal side-to-side movement, allowing you to control up to three effect parameters simultaneously, such as volume, modulation rate, and delay time. 20 factory patches are provided which are specifically designed for use with the Z-Pedal. A simple calibration procedure enables you to customize the Z-Pedal sensitivity, allowing the G5 to adapt to your particular pedaling style. The torque can be easily adjusted, and pedal range can be independently set for every patch. You can even set the minimum value higher than the maximum value for reverse pedaling effects. The G5 has a USB port for connection to any Macintosh or Windows computer, allowing it to act as a 2-input / 2-output audio interface. Simply launch your DAW or the included Steinberg Cubase LE software and start laying down tracks. Direct monitoring during recording ensures zero latency, allowing you to overdub with ease. The G5 is also fully compatible with Zoom's Edit & Share software, available below as a free download. This easy to use software allows you to catalog, edit and share your patches. Powerful sorting tools help you quickly find exactly the sound you're after, then drag, drop and reload them in whatever order you need for your next gig—easy to do with a laptop even if you're on the road. The Zoom G5 comes with a free download license for Sternberg’s Cubase LE music production software, providing not just the ability to create incredible guitar sounds in every box, but to do spectacular things with it. Take your recordings to a more professional level. Steinberg’s powerful and state-of-the-art audio software used by creators around the world now comes with every Zoom G3, G3X, and G5 purchase. 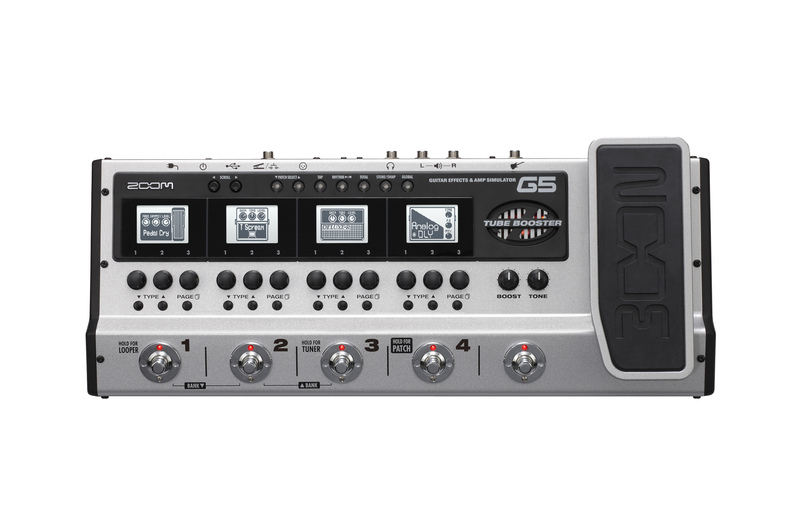 Eric Struthers, Musician for Zoom, demonstrates the G5 guitar multi-effects processor. 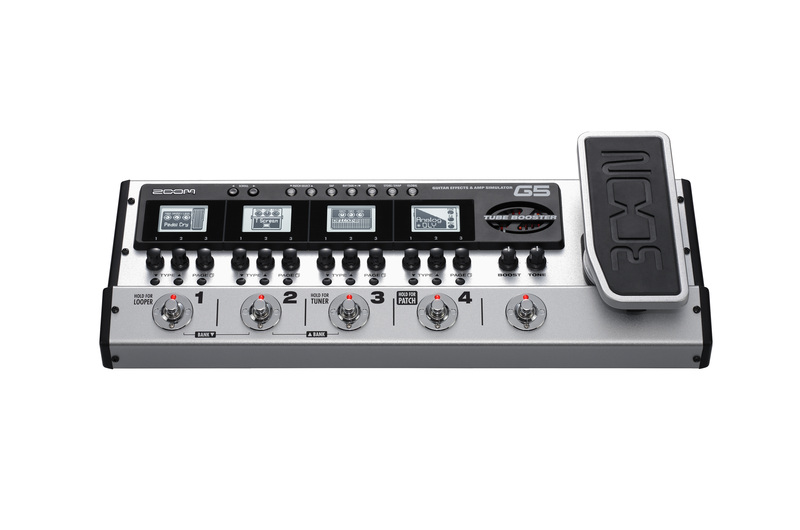 The G5 gives you pedalboard-like control and convenience, with the power of a multi-FX processor. It's great for guitar, but sweet for keyboards too!